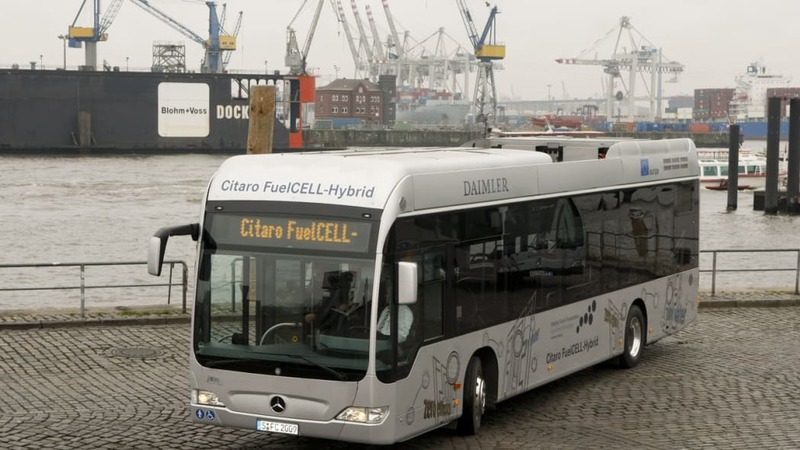 Daimler this week unveiled the first of its new generation Mercedes-Benz Citaro FuelCELL-Hybrid transit buses. Thirty of these new buses will be going into service in 2010 with the first 10 going to Hamburg Germany where previous-generation fuel cell buses have already been in service for several years. The new buses use the latest iteration of Daimler's fuel cell drive system which consists of a modular stack design. By building the fuel cell stack in modules, it can be scaled for different applications with the same hardware used in the bus and the new series of B-class F-Cell cars. Twenty of the fuel cell B-Classes will also be going to Hamburg for use by the transit company. The combination of the new stack design and a hybrid configuration using lithium ion batteries allows the fuel cells to operate at a more constant output with the batteries taking care of the transient acceleration needs. The result is that fuel consumption is cut in half compared to the older buses and the new buses have a range of 155 miles. The bus deployment is part of the Clean Energy Partnership which will see four new public hydrogen filling stations constructed in Hamburg. 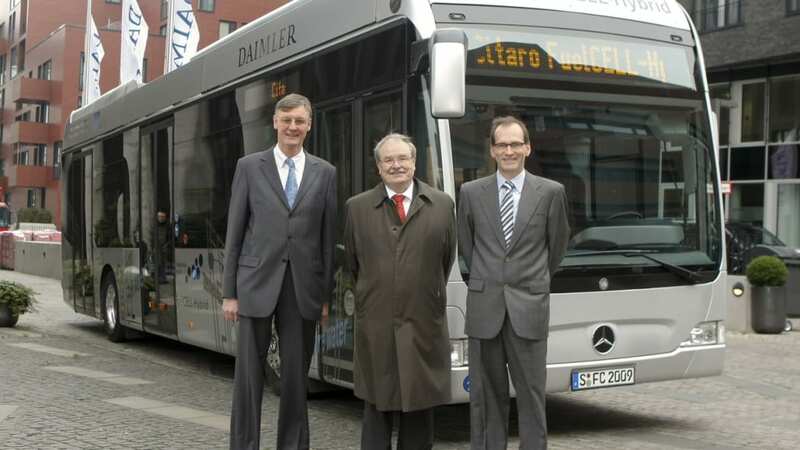 • 10 new fuel cell buses for "Hamburger Hochbahn"
Stuttgart / Hamburg, 16th November 2009 – The new Mercedes-Benz Citaro FuelCELL-Hybrid made its first appearance in its future operating location of Hamburg today. The exceptional feature of this latest-generation fuel cell hybrid bus is its outstanding environmental compatibility. The bus emits absolutely no pollutants while in motion, and it's also virtually silent, making it ideal for use in highly congested inner cities and metropolitan areas. From next year, no less than ten of the 30 vehicles that Daimler Buses is producing for European transport operators are destined for the Hamburg transport authority. In addition, Hamburger Hochbahn will take delivery of 20 Mercedes-Benz B-Class F-CELL cars starting 2010, which are also equipped with a fuel cell drive system. The Citaro FuelCELL-Hybrid is taking part in large-scale fleet trials which are due to take place in Hamburg and other European cities. This is a follow-up to the European Union's successful CUTE and HyFLEET:CUTE projects, which were carried out from 2003 to 2009. In the HyFLEET:CUTE project, a total of 36 Mercedes-Benz Citaro buses equipped with the second-generation fuel cell drive system have performed outstandingly for 12 public transport agencies on three continents, among them Hamburger Hochbahn AG. In more than 140,000 hours of operation, during which they covered a total of more than 2.2 million gererated kilometres, these environmentally compatible Mercedes-Benz buses have impressively demonstrated their ability to function reliably under operating conditions. "The new Citaro FuelCELL-Hybrid clearly demonstrates that electric mobility is already feasible today also with commercial vehicles", says Hartmut Schick, head of Daimler Buses. "Besides, synergy potentials with our Mercedes-Benz passenger car development and Daimler research can be optimally used in particular with the fuel cell drive system." 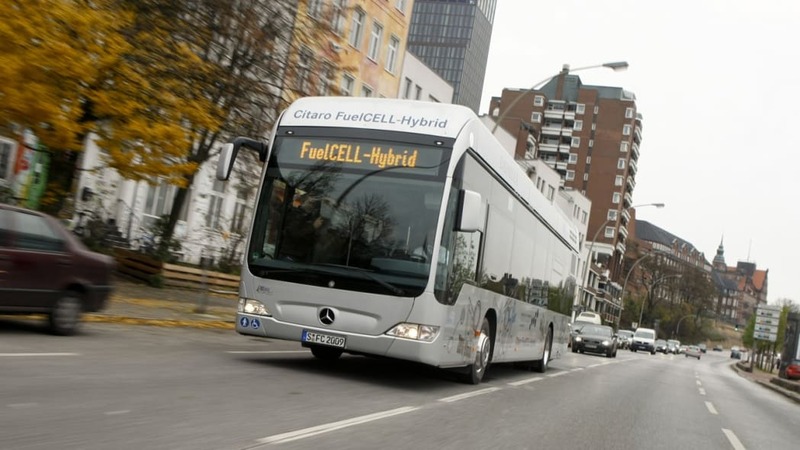 For the Citaro FuelCELL-Hybrid and the B-Class F-CELL, Mercedes-Benz successfully follows the cost-effective principle of using common parts. Components such as fuel cell stacks can be used as modules for both cars and commercial vehicles, for example: the new Citaro FuelCELL-Hybrid bus is e.g. powered by two fuel cell systems of the same type used in the B-Class F-CELL. Thanks to improved fuel cell components and hybridisation with lithium-ion batteries, the Citaro FuelCELL-Hybrid consumes almost 50 percent less hydrogen compared to the preceding generation. The operating range of the fuel cell bus is around 250 kilometers. The fuel cell drive system is also practically maintenance-free, and has a long operating life. The global initiative "Shaping Future Transportation" consolidates all the activities for sustainable mobility in the commercial vehicles sector at Daimler AG. The aim of this initiative is to use clean, efficient drive systems along with alternative fuels to realize zero-emission commercial vehicles for tomorrow's transportation needs. "Shaping Future Transportation" means conserving resources and reducing emissions of all kinds, while ensuring the highest possible level of traffic safety. The Citaro FuelCELL-Hybrid, developed with the support of the European Union, plays a major role in this. Prof. Kohler, Vice President e-drive & Future Mobility at Daimler AG: "Our intensive research and development conducted since 1994 has enabled us to bring the fuel cell to series production maturity. This enables us to entrust two fully practical electric vehicles with battery-electric and fuel cell drive systems to our customers – the smart fortwo electric drive and the B-Class F-CELL. The main objective now is to achieve a competitive cost level in comparison with conventionally powered vehicles and to create a full infrastructure of electric and hydrogen filling stations in cooperation with energy providers and the petroleum industry." In this large-scale project for the use of fuel cell technology in Hamburg, Daimler is cooperating with the city council as well as with Shell, Total und Vattenfall Europe. The aim is to accelerate the creation of an emission-free vehicle fleet and establish an appropriate infrastructure of hydrogen filling stations. The project is part of the Clean Energy Partnership in Hamburg and Berlin. It is being supported by the federal German government as part of the National Innovation Program for hydrogen and fuel cell technology (NIP). As part of this cooperation, four public filling stations with hydrogen pumps are to be constructed in Hamburg, enabling fuel cell vehicles to be refuelled within minutes. Thanks to the high hydrogen pressure of 700 bar, their operating range will then exceed 400 kilometers. This large operating range will make locally emission-free fuel cell vehicles fully suited to long-distance operations. Stuttgart, Germany-based Daimler AG, with its businesses Mercedes-Benz Cars, Daimler Trucks, Daimler Financial Services, Mercedes-Benz Vans and Daimler Buses, is a globally leading producer of premium passenger cars and is the global market leader for heavy- and medium-duty trucks and buses. The Daimler Financial Services division has a broad offering of financial services, including vehicle financing, leasing, insurance and fleet management. Daimler sells its products in nearly every country and has production facilities on five continents. Founders, Gottlieb Daimler and Carl Benz, continued to make automotive history following their invention of the automobile in 1886. As an automotive pioneer, Daimler and its employees willingly accept an obligation to act responsibly towards society and the environment and to shape the future of safe and sustainable mobility with groundbreaking technologies and high-quality products. The current brand portfolio includes the world's most valuable automobile brand, Mercedes-Benz, as well as smart, AMG, Maybach, Freightliner, Western Star, Mitsubishi Fuso, Setra, Orion and Thomas Built Buses. The company is listed on the stock exchanges in Frankfurt, New York and Stuttgart (stock exchange abbreviation DAI). In 2008, the Group sold 2.1 million vehicles and employed a workforce of over 270,000 people; revenue totalled €95.9 billion and EBIT amounted to €2.7 billion. Daimler is an automotive Group with a commitment to excellence, and aims to achieve sustainable growth and industry-leading profitability.